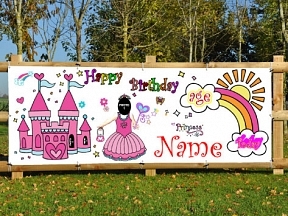 Personalised Birthday PVC banners. Throwing a birthday party? What better way to celebrate or surprise your loved ones than with a PVC Banner. 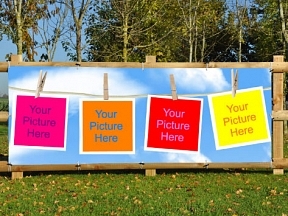 Email us your embarrassing photos and we will personalise your PVC banner to meet your needs. Birthday banners are among the most popular celebration banners at HFE. 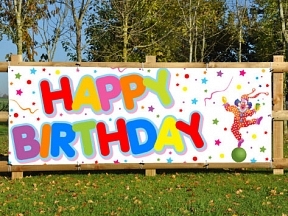 If you’re celebrating someone’s birthday or having a party, then PVC birthday banners are a great option to take. Birthday banners are cheap and start from £19.99. You can personalise your own banner using our free design service, with the friendly staff at HFE available should you need any assistance. 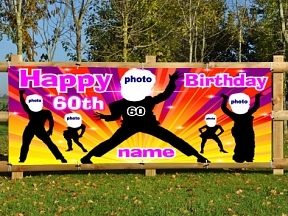 You might want to put some photos (embarrassing or otherwise) on your birthday celebration banners and it’s really easy to upload images and add them to your banner before ordering them. When you visit the birthday banners section at HFE, you will see a ready-made selection of PVC banners which you can either use or tailor for your own birthday celebration. Alternatively, they might serve as inspiration for you to create your own display item. Birthday banners are also fantastic when it comes to surprising somebody as part of a celebration. Many people order a birthday banner and drape it at a roadside or where they know it will get seen by the lucky recipient. The birthday and party banners created by HFE are made of strong PVC which means that they’re products designed for life and not just the big day. So you can either have the option of focusing on a particular milestone or alternatively a more generic banner for birthday boy / girl that can be wheeled out on an annual basis. Should you wish to order two or more celebration banners, then HFE will give you free delivery. Should you order your party banners by 11am, you will get next working day delivery. We’re proud of this speedy service and so are our customers – see the many positive reviews on TrustPilot for evidence of this. Some birthday banner templates merely require you to add photos, a name or a specific birthday message to complete the look and feel of your celebration banner. Alternatively, you can start with a blank canvas if you have a set idea of how you want your banner to look. Party banners are easy to attach providing that you have a specific area to place your display item(s). The celebration banners will come with rust-proof eyelets so it’s a simple case of affixing them in your designated area. The full solvent inks on the banners will ensure that no colours will run and they will look the part for as long as you want. 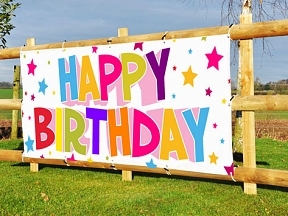 If you’re throwing a birthday party, then you can similarly order a party banner which might adorn your house, garden, church hall or community centre. They make a great addition to a party and ensure that whoever is celebrating their birthday is made to feel extra-special. The bright colourful banners that are produced by HFE also liven up a birthday party environment and they are easy to transport from one place to another.